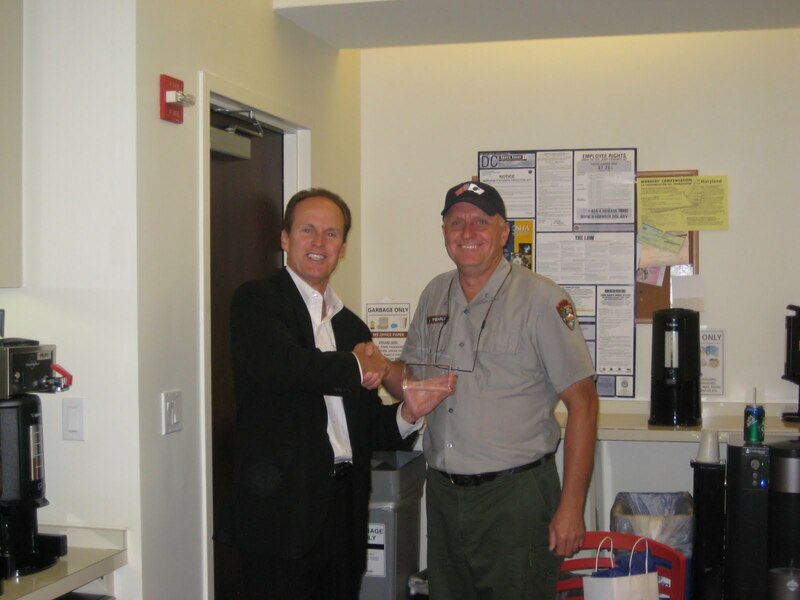 Last week, the National Law Enforcement Officers Memorial Fund Chairman's Award was given to an exceptional individual— National Park Service employee, John Wehrli. John Wehrli has been responsible for maintaining the Memorial for the past 18 years. During his nearly two decades spent at the Memorial, the well-kept, gorgeous grounds have spoken volumes about the Memorial’s devoted caretaker—it is no secret that John Wehrli took great pride in what he did. After his long stretch at the National Law Enforcement Memorial, he has been reassigned to the World War II Memorial. It is a testament to his dedication and hard work that the Memorial today looks just as beautiful as it did 20 years ago. He will be greatly missed. For his commitment and long, impressive career of keeping the Memorial as if it were his own yard, John Wehrli received the second-ever Chairman's Award. Fittingly, the award was presented to him by Memorial Fund Chairman & CEO Craig Floyd at a gathering held in Mr. Wehrli’s honor at the Memorial Fund offices. Staff joined together to bid John farewell and to thank him for his years of support and friendship. Mr. Floyd expressed his gratitude to the talented employee for his unique and remarkable work ethic and 18 successful years of upholding the Memorial, “It will be very hard to replace you, John," he said. About three weeks ago, San Diego (CA) Police Officer Jeremy Henwood entered a local McDonald’s to buy some lunch. When a kid approached him and asked for 10 cents to buy some cookies, Officer Henwood offered to treat him instead. He asked the young boy what he wanted to do when he got older… “Be an NBA star,” the kid said. Officer Henwood bought him the cookies and gave him a bit of advice, too—he told him to work hard and follow his dreams. Little did they know, this would be the last conversation Officer Henwood would ever have. Moments later, Officer Henwood left McDonald’s and got back in his patrol car. Sitting idle at an intersection, an assailant pulled out a shotgun, and shot Officer Henwood in the head. A four-year department veteran, Officer Henwood had just completed a tour of duty and had recently returned home from Afghanistan. The marine combat veteran had, in fact, served several tours of duty overseas—including two tours in Iraq as a U.S. Marine—but sadly, it turned out to be far more deadly for him here at home. His father, Rob Henwood, said he hopes his son's death will remind people about the recognition and honor police officers deserve. Leave a tribute to Officer Henwood at www.LawMemorial.org/Tributes. Sarah, the 22-year-old daughter of a retired San Bernardino City (CA) Police Lieutenant, is in the midst of running cross-country as a tribute to the memory of fallen peace officers and those who served in the Armed Forces. After graduating from college, Sarah was faced with the big question many recent grads encounter—what’s next? As explained on her blog “Chasing Asphalt,” Sarah didn’t know the answer to that daunting question. “So I decided to go for a run in the meantime … from California to New York,” she said. Her journey began on July 24 in Huntington Beach, and she is set to touch down in New York by late November or early December. While traversing the United States on foot is bound to be mentally and physically exhausting, Sarah said the purpose of her journey will enable her to persevere against all odds. So far, she has been accompanied by both law enforcement officers and firefighters—either escorting her in patrol vehicles or running alongside her—for as much as 40-mile stretches as she passes through the Morongo Basin in southern California. Although she never bargained for or anticipated any monetary support, she has received some donations that she plans to give to the National Law Enforcement Officers Memorial Fund, the Wounded Warrior Project, and the Fallen Firefighter Foundation.